At All Star Limousine we take pride in bringing you the best possible limousines and personalized service for your event. We operate 24 hours a day, 7 days a week, no matter what the weather conditions are outside. Our staff is always available and they are the very best in the business. At All Star Limousine we guarantee great service by employing only the most talented people in the limousine industry. With over 27 years experience and exclusively recommended by many top catering halls and businesses, All Star Limousine is the right choice for all your transportation needs. Our new corporate facilities are Leed Certified and built to meet the latest environmentally friendly specifications. We are located in Long Island, NY, but our services Worldwide. 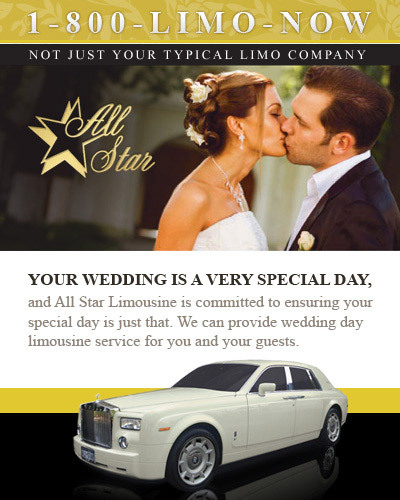 Without question, All Star Limousine is the best choice for all your corporate, wedding, prom and leisure limo services.